Reasonably priced. Great room. Quiet. lunch available. Small pool, was very cold. Breakfast was disappointing. Rooms were clean, staff was quick. Where to find Estevan hotels near an airport? Where can I find hotels in Estevan that are near tourist attractions? If you are visiting Southeastern Saskatchewan and are after a comfortable hotel or apartment in Estevan, there are several options. The center of Estevan has 7 hotels and apartments within 0.1 kilometres (0.06 miles). 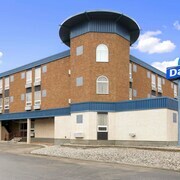 The Days Inn - Estevan is a much-loved hotel choice due to the fact that it is located so conveniently to Estevan's town center. 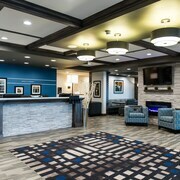 Our accommodation list contains only a limited number of budget accommodation options in Estevan. The Days Inn - Estevan is one of them. 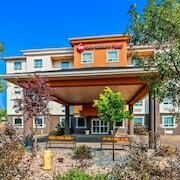 You could investigate the Super 8 Estevan, SK as well as the Microtel Inn & Suites by Wyndham Estevan. The Super 8 Estevan, SK is situated 1 kilometre (1 mile) from the heart of Estevan. 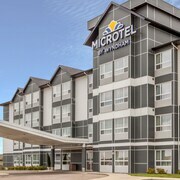 The Microtel Inn & Suites by Wyndham Estevan, is situated 2 kilometres (1 mile) away. Two more alternatives here include the Best Western Plus Estevan Inn & Suites and the Suburban Extended Stay Hotel. Looking for things to do? Consider spending a few hours exploring Soo Line Historical Museum and Turner Curling Museum, which you'll find in Weyburn, 85 kilometres (53 miles) to the northwest of Estevan. Should you wish to spend a few nights in Weyburn, check Expedia's booking pages for the latest deals at the Weyburn Travelodge and Weyburn Canalta Hotel. Or, you could consider staying in Carlyle, 75 kilometres (47 miles) to the northeast of Estevan, where you can choose from the Ramada Carlyle and Carlyle Western Star Inn & Suites. The Carlyle Golf Course and Carlyle Sports Arena are just a couple of the more popular sites to check out when you're in Carlyle. Before you say farewell to Southeastern Saskatchewan, make sure you see a game at Carnduff Centennial Arena if you can fit it into your itinerary. Book a place to stay nearby such as the Western Star All Suites Carnduff. Sloulin Field International Airport is situated 120 kilometres (73 miles) from Estevan. Should you wish to stay close by, can easily secure a room at the Holiday Inn Express and Suites Williston or Hampton Inn & Suites Williston. Are there hotels in other cities near Estevan? What other types of accommodations are available in Estevan? Explore Estevan with Expedia.ca’s Travel Guides to find the best flights, cars, holiday packages and more!